INGREDIENTS: CHICKEN BROTH (WATER, CHICKEN STOCK), CARROTS, POTATOES,TOMATO PASTE, CELERY, DICED TOMATOES (TOMATOES, TOMATO JUICE, CITRIC ACID,CALCIUM CHLORIDE), PASTA (WHEAT FLOUR, EGG WHITES), KIDNEY BEANS, GREENBEANS, ZUCCHINI, MODIFIED CORN STARCH, PEAS, SALT, CHICKEN FAT, YEAST EXTRACT,DEHYDRATED ONIONS, SPINACH, FLAVOUR, DISODIUM INOSINATE, DISODIUM GUANYLATE,SPICES, BETA CAROTENE, HYDROLYZED SOY PROTEIN, DEHYDRATED PARSLEY,CARAMEL, POTASSIUM CHLORIDE (SALT SUBSTITUTE), HYDROLYZED WHEAT GLUTEN. An Italian style soup made with kidney beans, peas, diced carrots and seashell macaroni. In a 4 quart pot combine one can of soup and one can of water. Simmer over low heat, stirring often. Promptly refrigerate any unused portion in a separate container. Recommend use by date on can. Store unopened can at room temperature. Serve as an appetizer or as part of a light meal. 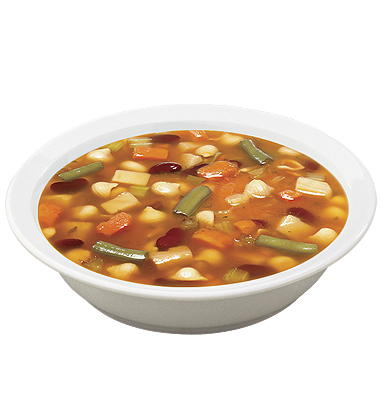 Excellent for use on soup and salad bars, and serving lines. *May include milk or milk products and eggs, but excludes meat, poultry, fish and seafood. For more information on our products, contact your distributor or call 1-800-461-7687..
To find out more about our merchandising and point of sale options, contact your Campbell's representative or call (800) 461-SOUP (7687) and ask about how your operation can benefit from our support.